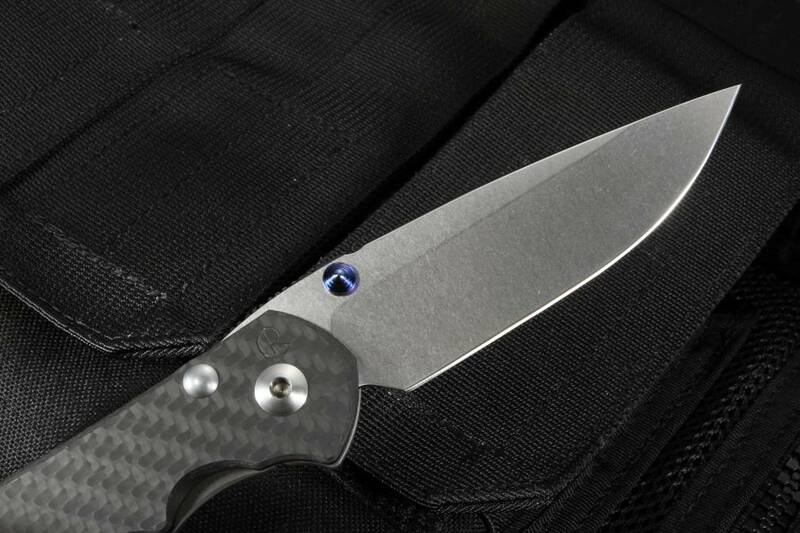 Carbon Fiber, you see it on high-end supercars, you see it used in the aerospace industry and now you can have it on one of the best folding knives made, our exclusive Chris Reeve Inkosi. There is a good reason that carbon fiber is used in high-tech products, it reduces weight while not compromising strength. Weight reduction comes in handy when you carry a knife, you want the highest quality fit and finish, but you want it in a tool that can be comfortably carried without being too heavy. 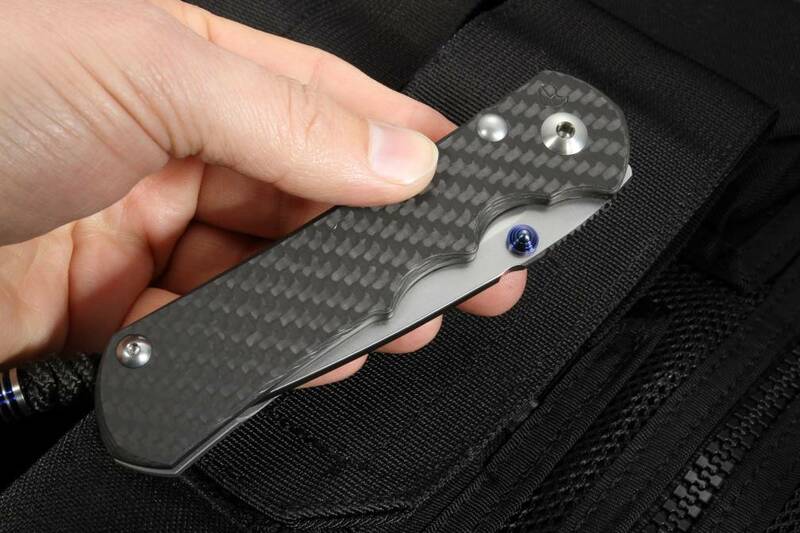 The Carbon Fiber Inkosi fits that requirement perfectly. The Large CF Inkosi comes with a blade that is 3.6" long, the standard titanium edition Inkosi knife weighs 5.2 oz. but with the carbon fiber scale, the weight drops to 4.0 oz! That extra 1.2 ounces of weight reduction provides the user with an outstanding blade-to-weight ratio. The carbon fiber is lightly blasted for texture, yet the weave pattern of the solid carbon fiber is clearly visible. 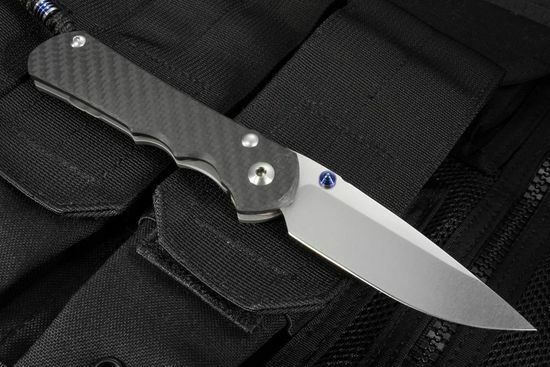 The Large Inkosi has a frame lock mechanism that Chris Reeve pioneered in the knife industry. 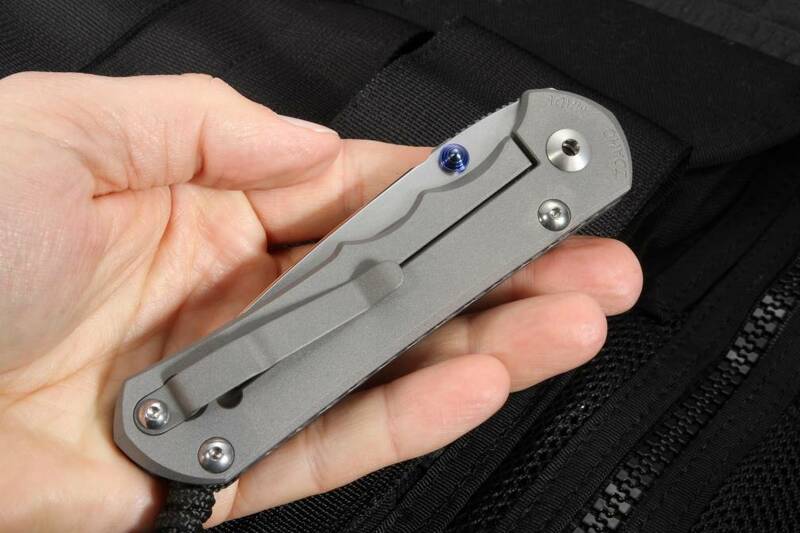 The lock construction puts a solid 6Al4V titanium frame behind the blade when opened. The frame lock construction along with the thumb lugs allow for easy one-handed opening and closing. Chris Reeve Knives goes the extra mile in fabrication, the machine lapping on both sides of the handle creates a perfectly flat surface, creating a "bank vault" feel when the lock engages. A key factor in any knife is the quality of the steel used. 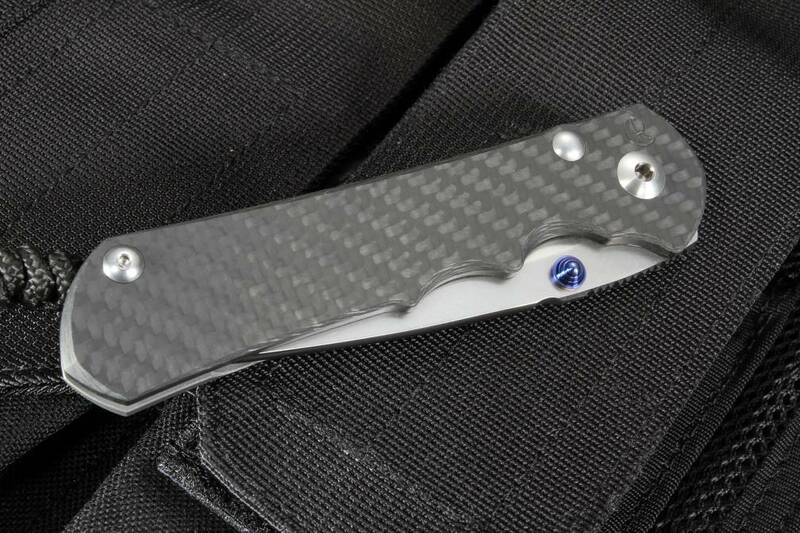 The KnifeArt.com exclusive Carbon Fiber Inkosi utilizes American-made CPM S35VN stainless steel made by Crucible Industries. The steel is heat treated to a Rockwell hardness of 59-60 for outstanding edge retention and impact resistance. The drop point blade has what Chris Reeve calls a wide hollow grind, somewhere between a hollow grind and flat grind. The 3.6" blade is a beefy .140" thick and has a scratch resistant ultra fine stonewashed blade finish. The thumb rest of the blade spine has textured jimping for positive grip. Another key feature of the Carbon Fiber Inkosi is the specially designed oversized phosphor bronze pivot washers. The washer material was selected to reduce friction and is perforated to further reduce friction. Another key feature of this knife is that it has a 1/8" ceramic interface between the titanium frame lock and the hardened steel blade. The ceramic interface provides a greatly extended lock life by reducing wear on the titanium lock face. The Chris Reeve Carbon Fiber Inkosi comes with a blasted titanium pocket clip and a black cord lanyard along with a machined titanium bead. The clip is angled in a manner that allows the clip to rest on the handle - not the lock bar. 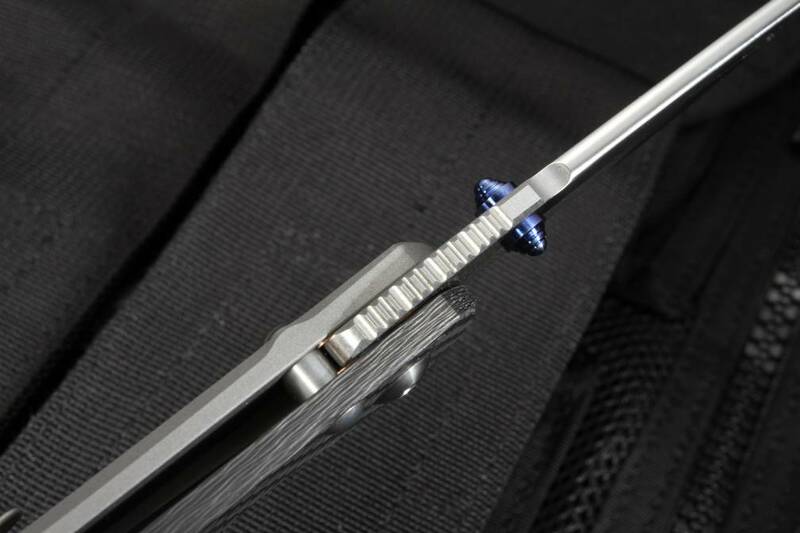 The knife has dual blue anodized titanium thumb lugs for easy opening right or left handed. The knife comes in the newest packaging with Loctite, CRK fluorinated grease, polishing cloth and disassembly tools. Beyond functionality, the three-dimensional black weave carbon fiber just looks phenomenal. This knife is made in Boise, Idaho by Chris Reeve Knives and is a KnifeArt.com exclusive.